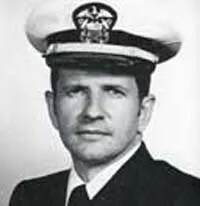 I graduate at the age of 17 from Sanford High School in 1955 and at the end of that summer I enlisted in the Navy on September 27, 1955 with the intent to qualify for the Naval Cadet program as soon as I turned 18. There was also a family history. My father had served in WWII on the cruiser USS Vincennes and an uncle completed a career as a YNC after serving on SS combat patrols in the Pacific, ultimately as COB. I went to boot camp at the United States Naval Training Center, Bainbridge with additional training at Norman, Oklahoma, Norfolk and Glynco. In August 1956 I was assigned to Naval Air Station Patuxent River as an Airborne Radar Operator on WV-2s (EC-121 Warning Star). 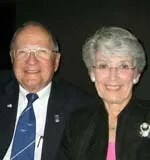 While here I married the former Carolyn Malone (my high school sweetheart) of Sanford, Maine on August 31, 1957. In October 1958 I went to Olathe, Kansas for Tower and Ground Controlled Approach School then on to Quonset Point for three years shore duty. I was well into training as an AC and, of course, had developed a bad attitude regarding officers! Made AC1 in 5 yrs., leaving little to look forward to (most Chiefs, in those days, did more admin than ops), so I succumbed to urging from an excellent Division Officer to apply for the Integration Program (“Seaman to Admiral”) and NESEP (Navy Program Seeks Officers From the Ranks). 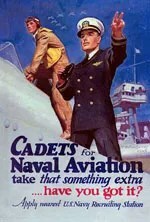 I was selected for both; decided I could always get an education, but it would be my last and only shot at Wings of Gold, so accepted orders to Flight Training, via OCS at Newport. While in training I flew the T-34, T2A, F9F Cougar, and F-11 Tiger – how’s THAT for dreams come true!! I next went to Naval Justice School at Newport, then on to the A4 RAG, VA-43 at Oceana as a Fleet Replacement Pilot. I completed RAG training in June 1964 and immediately reported to my new squadron, VA-72 at Oceana, flying the A4E Skyhawk. I became the squadron Legal Officer and Landing Signal Officer trainee. Significant cruises were in the Mediterranean in the fall of 1964 and in the Western Pacific in 1965, both on the USS Independence. I finished the 1965 cruise as a fully qualified LSO. I finally dropped my legal duties and moved the family to Jacksonville, Florida in January 1966. After a few more training cruises, I shoved off for Vietnam again, this time aboard the USS Roosevelt. In May 1965, I made my first combat cruise aboard the USS Independence (CVA-62). 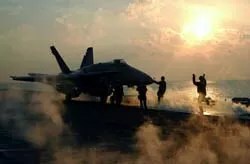 The ship was deployed for more than seven months, including 100 days in the South China Sea off the coast of Vietnam, the first Atlantic Fleet carrier to do so. She also was the fifth U.S. carrier to operate off Vietnam. We participated in the first major series of coordinated strikes against vital enemy supply lines north of the Hanoi-Haiphong complex, successfully evading the first massive surface-to-air missile barrage in aviation history while attacking assigned targets, and executing the first successful attack on an enemy surface-to-air missile installation. During this cruise I lost my roommate to hostile fire. 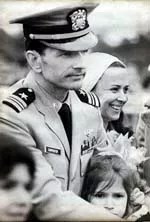 On September 13, 1965, LTJG Joe Mossman launched in his Skyhawk (“Scooter”) attack aircraft as the number four plane on an armed reconnaissance mission over North Vietnam. Only the month previous, two A4E’s had been the first Navy aircraft to be shot down by surface-to-air missiles (SAM). They claimed so many American planes in the duration of the war. When the flight was over the target area near the city of Dong Hoi in Quang Binh Province, Joe’s aircraft was hit by small arms fire. No ejection was observed. The aircraft crashed approximately 12 kilometers west of Dong Hoi, near Route 101. Search and rescue (SAR) was flown over the crash site but no signs of survival were spotted. Joe was initially placed in a status of Missing in Action which was later changed to Killed in Action/Body Not Recovered in 1973. On November 1, 1966, I was leading a flight of three F4s on a missile suppression mission in support of a vital photo reconnaissance flight in the Haiphong area. It was my 107th combat mission. Flying over a missile site I was hit by anti-aircraft fire. Almost immediately my plane caught fire and my controls began difficult to use. As I had been trained to do, I headed for open water where I lost complete control of my plane. I punched out of my crippled plane suffering severe injuries from the high-speed ejection and fell into the ocean below that was filled with many North Vietnamese fishing boats. My six years and four months as a P.O.W., for mostly obvious reasons, the first of which was the realization that I was so fortunate to serve in the company of heroes, to survive, and to have served my Navy and my country with honor! Also during all that time the feeling that my wife and children needed me home, safe and sane, and the firm conviction that the United States of America would never abandon its prisoners of war, sustained me whenever I got to feeling particularly blue. In early 1973, we started hearing rumors that the U.S. and Vietnam were conducting peace talks that could lead to our release. 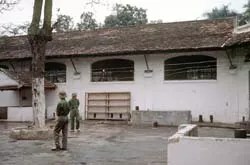 That rumor became a reality beginning in February when we learned all 591 American prisoners of war still held by North Vietnam were going home. A few days later, I touched American soil for the first time since the mid-60s when my plane home landed at Logan Airport in Boston. After receiving the proper medical attention I returned to my hometown of Sanford Maine to be with my family and to start life anew. This photo was taken of me with my family at the Sanford airport moments after my return after six years of captivity as a POW of the North Vietnamese. Since that day, March 4, 1973 has gone into my personal history as the happiest day of my life to date and one that will be celebrated as my “Re-birthday” from here on out. IF YOU RECEIVED ANY MEDALS FOR VALOR OR AWARDS FOR SIGNIFICANT ACHIEVEMENT, PLEASE DESCRIBE HOW THESE WERE EARNED. Three Silver Stars – first for leading the Iron Hand, SAM suppression flight (my flight of 3 destroyed the SAM site) on which I was shot down and captured; 2nd and 3rd for enduring severe torture sessions in prison; Legion of Merit and 2 Bronze Stars for particular actions while a P.O.W. ; some of my 11 Air Medals and four Navy Commendations for individual, noteworthy, combat flights. My final assignment in the Navy was as an instrument flight instructor in Virginia and where I retired from the Navy in late 1978. We remained in Virginia living on a tributary on Chesapeake Bay. Every summer we would return to Sanford to visit our friends. I worked as a small marina owner; marine railway operator; ultralight aircraft sales and service; and aerial photographer. In 2007, I returned to Vietnam with my wife and two of our daughters. I must admit I traveled there with some trepidation, but ended up having a wonderful time. We found no evidence of hatred or dislike or violence there. While Vietnam is still a communist nation, I noticed that the country has changed dramatically and that capitalism has made tremendous inroads. We even toured the Hoa Lo Prison, which is now part of a museum. We went into the room where I and the other POWs were held captive more than 30 years earlier. It brought back memories it had taken me years to forget but I glad I made the trip. I continue to act as guest speaker at events where POW/MIA issues are discussed. Nam POWs: a matchless fraternity of love, respects and support. I thoroughly love and appreciate every aspect of my Navy career. I am very proud of my enlisted service, from AA to AC1. Those years gave me a basis, understanding and appreciation of ALL of us – enlisted and officer – that would serve me extremely well throughout the rest of my career – from squadron Legal Officer to X.O. Always serve with pride, and honor, never forgetting that you are ambassadors of our country, and the protectors of our freedom and the U.S. Constitution! For me, TWS is a chance to connect with old friends, make a few new ones along the way. I’ve enjoyed putting my profile together and telling a bit of my story. I know it will be well taken care of long after I am gone. My sister-in-law wore LCDR Carpenter’s POW bracelet in elementary school while he was held captive. She still occasionally wears it. Please leave a message at 303-736-9237. Not a joke or gag, it feels like the right thing to do. I was born in 1960 and my father served in the Navy. I wore your fathers POW bracelet (copper) and would like to give it to you, if you would want to have it . Please call me and I would love to send it for Christmas. I am not great at finding replies in SPAM. I even have the blue slicker on the copper bracelet.